DIEGO BROGGIO DJ & PRODUCER known internationally as the founder of DB Boulevard. His career began on the first free radio in Padova.. A musical background of the highest level, his keen taste in new musical trends from alternative to commercial music, quickly projected him as a dj in the most famous clubs in Veneto. With the first movement of house music he launched his name to prominence! His passion for music and entertainment extended from djing to clubbing. 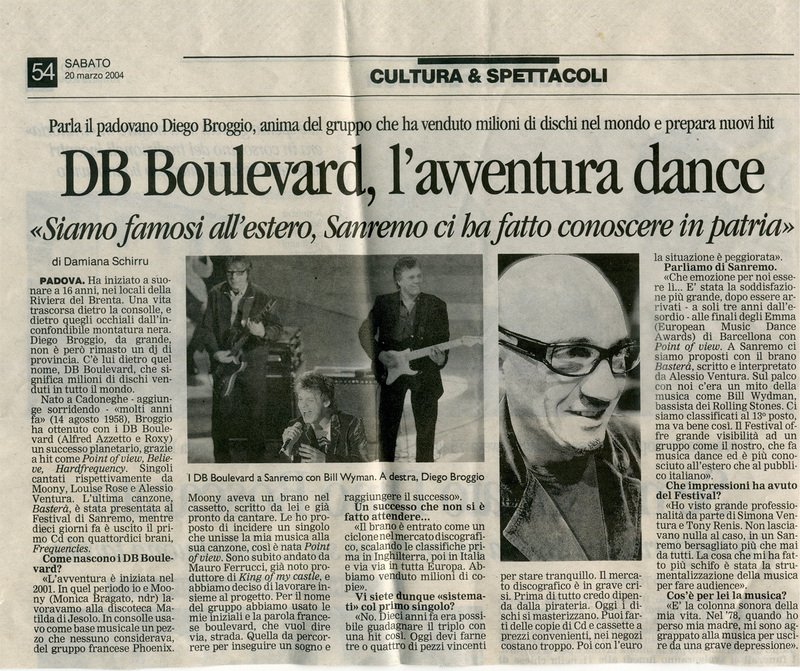 In 1991,he created the BBS Comunication, agency management and management of clubs where Diego Broggio was the Resident. in these years also began collaboration with Diego's vocalist Moony who participated in the great success of Point of View. summer (2001) Diego Broggio and BBS acquired Matilda at Lido di Jesolo, already a well known nightclub and succeeded here to build a brand that became a historical reference point both nationally and internationally for lovers of nightlife. The managerial commitments didn't, however, take Diego Broggio away from his true passion: producing music. With this goal in 2001,he founded the DB Boulevard,for AIRPLANE RECORDS of mauro ferrucci and frankie tamburo..During this time, In the same summer Matilda dance floor became the testing ground for DB boulevard first single: POINT OF VIEW! This great song left a permanent mark on the history of modern pop music and in the world wide charts: top of the chart in Italy (gold and platinum disco),#3 in Great Britain, in top of the Billboard ranking in the US!!!!! 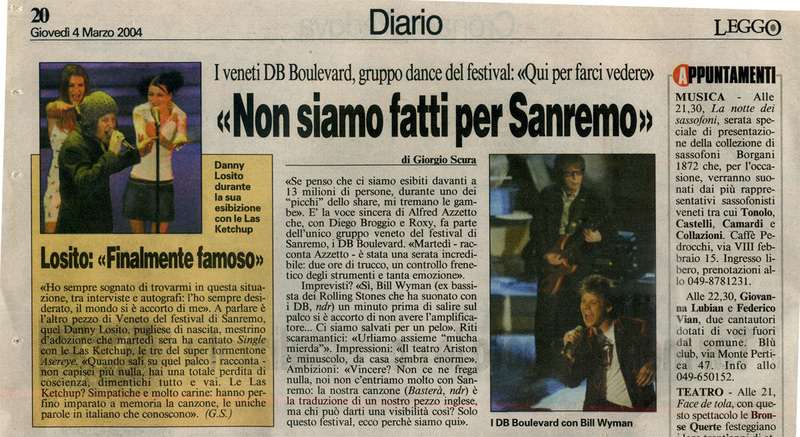 In the same year (2002) the DB Boulevard won the Italian Dance Awards and were nominated for the MTV Music Awards in Barcelona against the likes of Moby, Kylie Minogue and Sophie Ellis Bextor. Determined to continue their fortunate journey, they once again collaborated with vocalist Moony which gave birth to "Fly Away" ,a new hit played throughout all the stages of summer Festivalbar. In September 2002 came the second single "Believe" sung by Louise Rose and written by Moony which didn't disappoint: the song in fact topped the Number One in Australian charts,#1 in Dance all Chart, #3 in the MTV Dance Chart and like "Point of View" reached the European Top 20 and DB Boulevard were again nominated for the Italian Dance Awards. In 2003,the third single "Hard Frequency", was used in the "Garnier" advertising campaign and reached number 3 in MTV Chart and Dance All Chart. 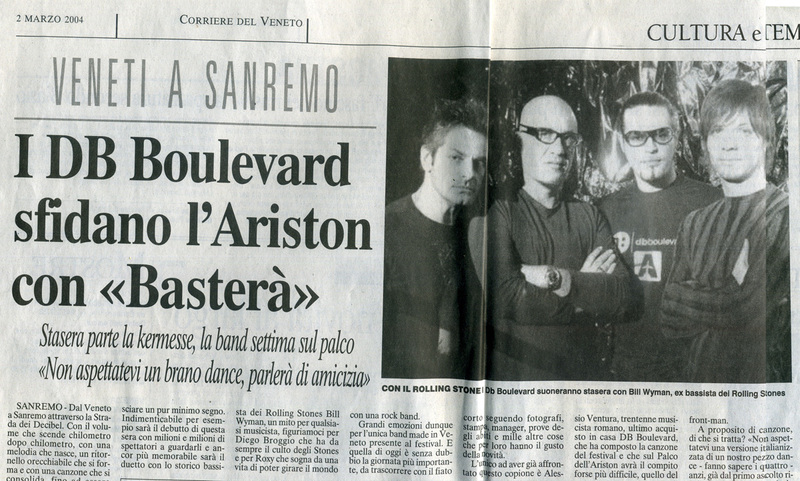 In 2004 the DB Boulevard came to the Sanremo Festival with a song entitled "Bastera'", which sow the collaboration with Rolling Stone bass player Bill Wyman, the song obtained 9 ° place. 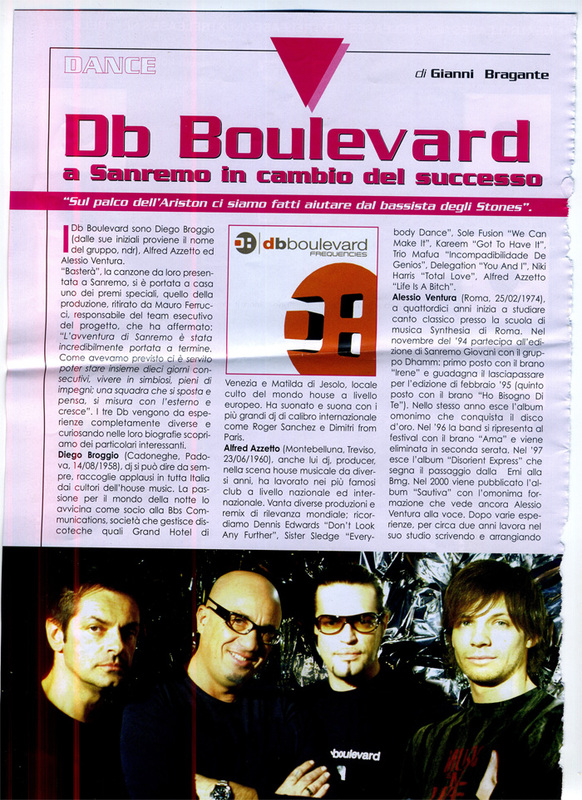 After this experience the DB Boulevard and Diego Broggio published their first album Frequencies, which contains all their previous singles including "Bastera'". After a year and a half of absence from the recording studio, Diego Broggio returned in June 2006 with DB Boulevard label Airplane and a new single, "Chance of a Miracle". The vocals this time were one of the coolest singers in the international dance scene, J.d. Davis. This became the soundtrack of summer 2006. In addition to the career of producer, Diego Broggio aka DB Boulevard continued as dj free lance for Airplane, Mauro Ferrucci's label in the most important European club set with unmistakable passion, and technical sophistication. In 2007 the new single "Over and Over" was released featuring Diego Broggio and Tommy Vee. Broggio Diego continues its special DJ set in 2009/10 and devotes considerable time to improve his technique, always looking for new ideas and sounds. 'the winds of change are blowing' so got a new production team nd - waiting for a new EPs called "Want to Be Your Lady" feat. Monika Jefferies - in the middle of 2010.In the 2011there is the follow up " last true lovers FOR MOLTO RECORDING and in February following the project DB is ready for summer 2011:GET UP AND DANCE. Out in 2011 the follow-up "TRUE LOVERS ALWAYS LAST FOR RECORDING THE VERY next February and the project DB is ready for the summer of 2011," GET UP AND DANCE "n October of that year in collaboration with "MOLTO RECORDING", released the single "Little Love". May 2012, THE NEW SINGLE "THE POWER OF LOVE" For his debut single on Ego, Diego Broggio use of the valuable assistance of another of our local pioneers of House music, Castaman and the vocal talents of Miss Domino. Spring 2013 new production on Purple music: Diego Broggio and Castaman feat. Roz Brown "Get Dancing". June 2014, “King of a Ghost Town”, is the right and perfect charge and energy for the upcoming summer. “King of a Ghost Town” is out with a perfect package for all tastes. Remixes by Keller and Crossfingers are included, together with Castaman Massive Mix. On July 2014 a new summer hit "Come On Get Up" remixed by The Cube Guys is ready for the dancefloor. 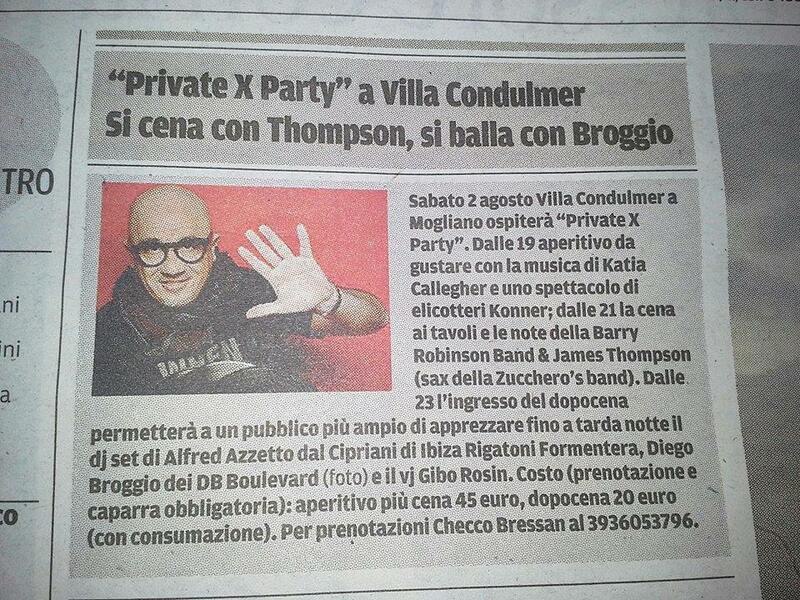 diegobroggio.com - Copyright 2014 © - All Rights Reserved.